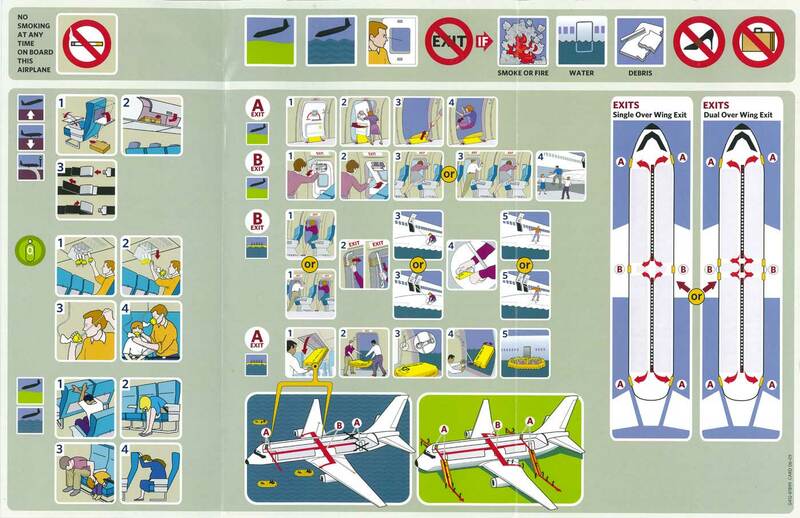 This safety pamphlet depicts the proper procedures required of passengers on Delta Boeing 737-800 flights. This range of bountiful data is multimodal with its inclusion of images, numbers and words, all used to emphasize safety steps in a clear and concise manner. There is a clear unification of numbers and images happening in most of the small multiples. Those images have a number in the upper left hand corner signifying the order that they go in creating a comparison over time. You have to compare image 1 with image 2 in order to detect a change, and so on until the numbers run out. That constant comparison is how you can tell the small multiples are changing, teaching you something new. The images change from small multiple to small multiple, but the color palette seems to stay the same with blue, white, purple, grey, and yellow. The major color change that exists is when red is used to draw attention to something or give it negative connotations. There are images with red circles and a slash through them signifying a difference. That you are not supposed to do whatever the image is depicting. Another example of color drawing attention to differences is in the bottom two pictures in the middle of the pamphlet. Both of these images have the same plane, but the color of what they have landed on is different. The green is for land and the blue is for water, highlighting the different procedures that should be followed while the plane stays the same. There is a lot of segregation happening in this pamphlet with the use of two greyish colored boxes, one covering most of the page, and the other a small banner at the top. The one at the top depicts what you are not allowed to do on the plane as well as what has to take place for you to exit the plane. It is more of an overall summary or visual title. The larger bottom box sections off the main chunk of information containing lots of smaller multiples that show step by step instructions. These two grey boxes are connected to one another because they are depicting information in the same way, but the content is different enough that it needs to be separated. In a way, these two boxes are drawing comparisons to a text with a title and a body of information that would be seen in an all verbal article. Disruptive divisions can be found all over this pamphlet instead of silent grids. Each box is separated from the grey background by a white border. Even the black number in the corner is sectioned off by a white box. In the case of this safety pamphlet I believe that the clear division of small multiples is necessary to deliver the information effectively. Each image needs to be seen separately and within one eye span in order to help people make effective and possibly lifesaving comparisons. The fact that the corner of the white borders are rounded helps to make that divisions a little less harsh and disruptive. There is very little text/words utilized in this image, other than to highlight the nonsmoking policy, clearly signaling the exits, and listing what would warrant getting off of the plane. This tells me that information is important enough that the designers did not want to rely on images alone, but rather have them work together in a multimodal design. Overall, I think that this image does a good job illustrating the different principles that Tufte talks about in his books. This entry was posted in Fall 2014 Archive (338) and tagged bountiful data, disruptive divisions, Fall 2014 Archive (338), small multiples, Small Multiples 338 Fall 2014. Bookmark the permalink.